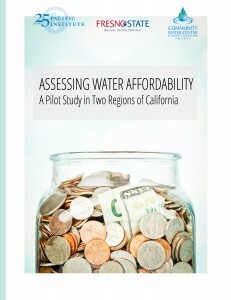 A new study from the Pacific Institute in partnership with Community Water Center and Fresno State University, Assessing Water Affordability: A Pilot Study in Two Regions of California, addresses these questions and finds that over 100,000 households in two regions (the Sacramento metropolitan area and the Tulare Lake Basin) do not have access to what is considered “affordable” water. In addition, the study finds that the current metrics that the state is using to measure affordability would not capture many of these people. These metrics focus on water affordability at the water system level, which can encompass a variety of different socio-economic groups. In the Sacramento metropolitan region, measuring overall affordability for water systems misses serious affordability problems at the household scale. A water system with overall affordable rates may have many households whose costs for water may great exceed formal definitions of affordability. Similarly, in the rural Tulare Lake Basin, measuring on these different scales means finding only nine out of 51 water systems with unaffordable rates vs. nearly 4,000 households with unaffordable water rates – some 40% of the households in the study group. The Institute’s analysis also showed that water affordability is likely to become an even greater problem in the future. The cost of water provision rising in both urban and rural areas, with much of the water infrastructure in the U.S. at, or beyond, its useful life. Infrastructure replacement costs will significantly contribute to the problem of unaffordability unless these costs are paid for in great part by external funds or financing and pricing approaches are developed that protect low-income consumers. In addition, some water systems, such as many in the Tulare Lake Basin, are facing challenges as legacy nitrate pollution or other contaminants like arsenic and DBCP continue to contaminate water supplies. In these areas, households must spend an even greater percent of their income purchasing replacement water, making affordability an even greater challenge. If the persistent water-quality problems in the Central Valley worsen, water treatment costs will increase, and systems may be forced to increase their water rates, leading to increasing water bills in an area already plagued with high levels of unaffordability. Indeed, more and more water systems may find themselves in a difficult financial situation, torn between the need to upgrade or increase treatment to ensure safe drinking water while also keeping water bills low enough for customers to have access to affordable water. More specific discussion of developing affordability programs, whether within or across systems, is critical for California, and more work is needed to address financing considerations for water systems, and their technical, managerial, and financial capacity, as well as how to protect the poorest and most vulnerable populations from rising water costs.